On Sunday was the Seafood Festival and it was so much fun. We had different "booths" in a sense with fish printing, clam painting and fish-prints for sale. I painted 2 child like clams and it was the best. My buddies Mermaid Man and Plankton drawed a lot of attention by the kids and they received several compliments. I also went to the guy who does body spray paint and we had to get the official tattoos. 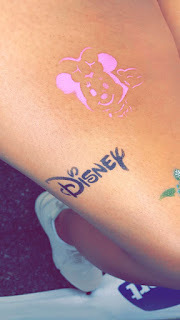 i had to get my Minnie Mouse and the trademark as he stated. While working for Save the Harbor/Save the Bay you get in touch to your child like memories and self. This year brought me back to last year when Rusenny and I painted Spongebob and Patrick on the clams. I'm glad Save the Harbor gives us the opportunity to enjoy being a kid and help other kids out. I enjoyed the festival and I can't wait until the next one.